On the 6 September 2017, ECN organised a workshop in Brussels in collaboration with the European Committee of the Regions (CoR). It was held under the patronage of Dr Babette Winter, CoR Member and Rapporteur of the Circular Economy, and State Secretary for Culture and Europe in the Thuringian State Chancellery, Germany. Over 80 delegates heard from representatives of the European Commission, European Parliament, member states, industry organisations and municipalities about biowaste and revisions to the Waste Framework Directive. The workshop was timed to coincide with trilogue discussions about biowaste in the revised Waste Framework Directive (WFD). The morning session focussed on policy, with the afternoon session concentrating on practice. The presentations of the workshop can be accessed here. 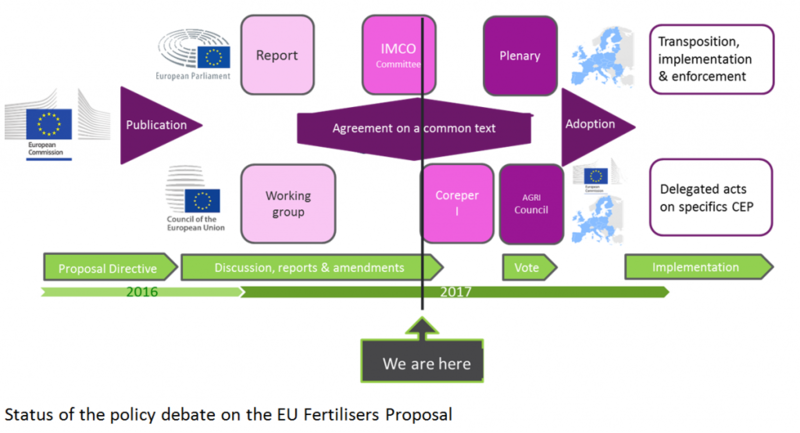 After the vote on the opinions of the ENVI, AGRI and INTA Committees on the Commission’s proposal for a fertilising product regulation, the IMCO Committee published its final draft report on 25 July 2017. The first reading in the Plenary is scheduled on 3 October 2017. If adopted as such, the report would lead to the exclusion of bio-waste materials for CE marked fertilising products, and thus would position the Parliament against overall Circular Economy goals. ECN therefore calls upon the MEPs to consider making the necessary changes to these and other aspects in the report, following the suggestions as included in the latest ECN recommendations ahead of the Plenary vote ahead of the Plenary vote, in order to fulfil the shared objective of ensuring recycled bio-waste and other secondary raw materials will be part of CE fertilising products. The Internal Market and Consumer Protection Committee (IMCO) has the overall lead on the discussion on the fertilisers proposal in the European Parliament and voted on its report on 12 July 2017. Based on ECN’s position on the Commission’s proposal the European Compost Network has followed the debate in the European Parliament and expressed again that harmonised and reliable criteria for compost and digestate, which will be placed as organic fertilisers and soil improvers on the European market should be set. These should be based on the technical proposal on end-of-waste criteria for compost and digestate, worked out by the Joint Research Institute ‘IPTS’ of the European Commission. After the final vote on the Parliament’s report in October it is likely that the inter-institutional discussion between the Commission, the Council and the Parliament will start. This year's Experience Exchange Day (Erfahrungsaustausch Kompost) provides latest information and updates on composting. Efforts to collect biowaste and biowaste management in Linz and Upper Austria will be discussed and open questions on the approval of composting plants are examined. In several lectures (in German language), the future of sewage sludge utilization in Austria and Europe will be discussed and the Federal Waste Management Plan 2017 and current discussions at EU level will be examined in this context. Information on the newly established Compost and Biogas Association Austria (KBVÖ) and the activities of the ÖWAV as well as an excursion to the extended facility of Huemer Kompost GmbH round off the ERFA compost 2017. For years this congress brings together experts from industry, business representatives, municipal companies operating in that area. Many representatives of central and local government and scientists are present at this event. During the two days of the congress held several sessions covering the most important topics of environmental protection. For several sessions translation in English is provided. Further information on the ENVICON can be accessed here. It is part of the European Unions’ Horizon 2020 project DECISIVE (A decentralised management scheme for innovative valorisation of urban waste). Presentations will be held about food waste including avoidance and valorisation options, followed by a round table discussion and get-together lunch for further discussions. The participation is FREE of charge, but LIMITED in the number of participants.